University of Arkansas issued the following announcement on March 6. Kareem Abdul-Jabbar is most widely known for his accomplishments on the basketball court – in college at UCLA, and in the NBA, where he still holds the record as all-time leading scorer. That mind will be on display – on a basketball court, as it happens – when he appears as the latest speaker in the University of Arkansas student-sponsored Distinguished Lecture Series at 7 p.m. Thursday, March 8, in Bud Walton Arena. The event is free, open to the public and no tickets are needed. 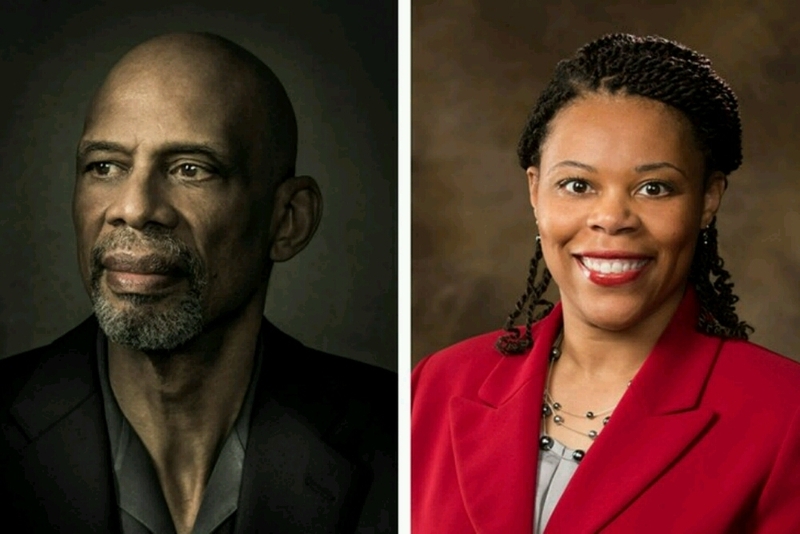 The arena’s south entrance doors open at 6 p.m.
Abdul-Jabbar will discuss his life and careers as athlete, author, actor, social activist and philanthropist during a question and answer session moderated by Pearl Dowe, associate professor and chair of the U of A political science department. Members of the audience will also have the opportunity to text questions to be asked during the program. A small group of students will also be invited to take part in a personal question and answer session with Abdul Jabbar before the lecture event in Bud Walton. Students who want to be part of that small session can fill out an online questionnaire at Kareem Abdul Jabbar Q&A. Seating is limited, so student members of the Distinguished Lecture Series committee will choose those who are invited to attend. Kareem Abdul-Jabbar has pursued several successful careers since retiring from the NBA in 1989: appearing in movies and television; writing or r co-writing several books; speaking out on a variety of social issues and writing a regular column for Time magazine; and developing the Skyhook Foundation to bring educational opportunities to children in under-served communities through innovative STEM programs. He most recently published a memoir for young readers, Becoming Kareem: Growing Up on and off the Court. For all of his accomplishments, including serving as a U.S. cultural ambassador, Kareem Abdul-Jabbar was awarded the Presidential Medal of Freedom by President Barack Obama in 2016. The Distinguished Lecture Series is a student-sponsored program. Speakers are chosen by a committee of students, faculty and staff, and the events are funded by a student-approved fee, appropriated by the Programs Allocation Board. Recent speakers have included Bill Nye the Science Guy, astronauts Scott and Mark Kelly, web-sensation Brandon Stanton and actor Tony Hale.